First introduced at the Albuquerque Balloon Fiesta in 1978, the balloon perfectly represented the RE/MAX network’s “Above the Crowd” commitment to quality. Today, the nearly 110 RE/MAX Hot Air Balloons in operation comprise the largest fleet on the planet. Read more RE/MAX balloon facts here. Look for the RE/MAX balloon at the annual event The Great Reno Balloon Races at Rancho San Rafael Park in Reno, Nevada each September. With one of the few balloons available for tethered rides, RE/MAX Realty Affiliates agents offer tethered rides to the general public and to their clients with 100% of the proceeds benefiting the Renown Children's Miracle Network Hospitals. Learn more about how we are giving back to the community here. At RE/MAX Realty Affiliates, we've raised the bar to the highest level. 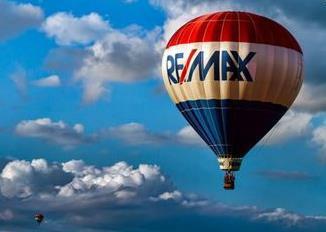 The gold RE/MAX Realty Affiliates balloon signifies that higher standard. When you see the RE/MAX balloon, think of the biggest real estate network in the world and when you see the GOLD RE/MAX balloon, rest assured you are working with the very best.